After much backlash, city leaders in Independence have put a hold on smart meters for the city's utilities. INDEPENDENCE, Mo. 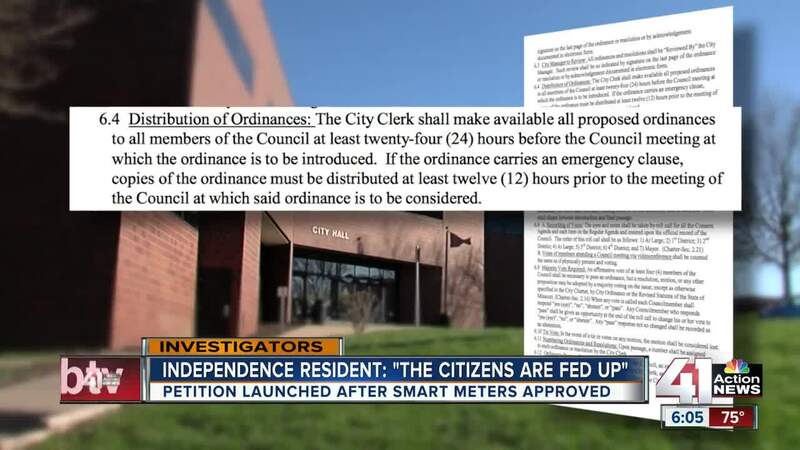 — After much backlash, city leaders in Independence, Missouri, have put a hold on smart meters for the city's utilities. On Monday, Councilman Tom Van Camp introduced a resolution to delay the project, pending the outcome of a petition aimed at keeping smart meters out of Independence. The motion passed. Lucy Young, an Independence resident and former City Council member, kickstarted the petition by collecting signatures outside City Hall prior to Monday's vote. "There were over 200 signatures gathered from our petition last night," Young said Tuesday. "I cannot keep up with all the demands on social media and phone calls." Councilman Curt Dougherty made a motion on April 1 for the city manager to approve a contract with Core & Main to install smart meters for Independence utilities, which passed in a 4-3 vote. The decision shocked some members of the community, who thought the issue was dead after a majority of the City Council voted against smart meters last month in a public forum. "Out of the blue comes this negotiated contract," Young said. "It was very underhanded, very secretive." The item wasn't placed on the city agenda for public viewing before the abrupt vote. Councilwoman Karen DeLuccie said even she didn't know smart meters would be brought back up for consideration after being struck down. "I was taken aback," DeLuccie said. "You can't legislate by the seat of the pants in the dark." According to the city's rules of procedure, the city clerk "shall make available all proposed ordinances to all members of the council at least twenty-four (24) hours before the council meeting at which the ordinance is to be introduced." However, DeLuccie said a technicality is what allowed the members of the council to bring smart meters back up for a vote without notice.The motion to have the city manager negotiate a contract with Core & Main to install the smart meters is considered a non-action ordinance as opposed to an ordinance. DeLuccie said the difference between the two is that City Council members don't have to follow a certain set of procedures, such as placing the item on the agenda, when bringing a non-action ordinance up for a vote. "People have a right to know what we're doing," DeLuccie said. "This is inappropriate." Young needs to collect more than 3,000 signatures from registered voters. However, her mission comes with a greater message to those in power. "The citizens are fed up," Young said. "We've seen way too much and we're just not going to take it anymore." A group of people will be collecting signatures at the Hy-Vee at 23rd Street and Lee's Summit Road at 7 p.m. Tuesday.